Ah the humor of Alaska. The map above is a good example of Alaskan humor. So click on the image to enlarge it. 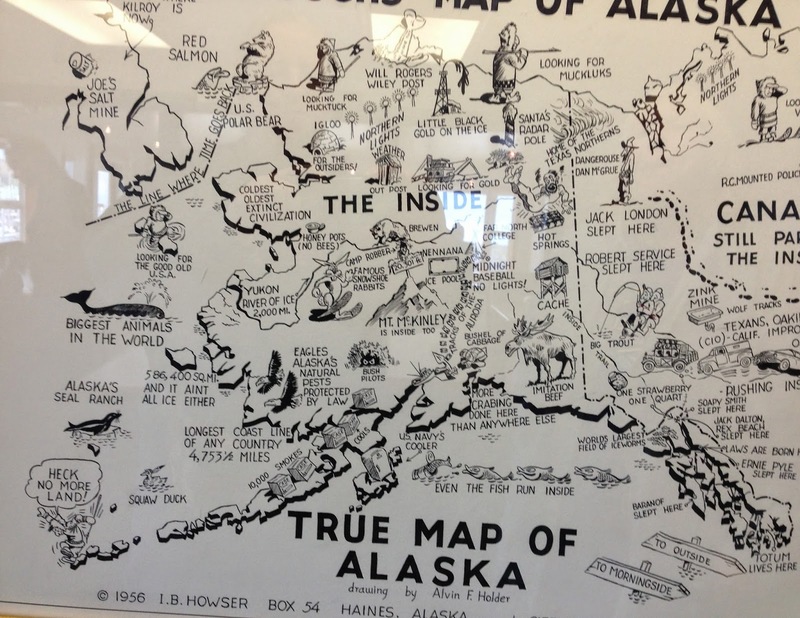 If you want to see the whole map, you will find it at the Lighthouse Restaurant in Haines. The day we arrived in Haines was the sum total of sunshine I guess I will see for awhile. Its been non-stop raining ever since. Fortunately, I found a colorful subject to add to my blog. 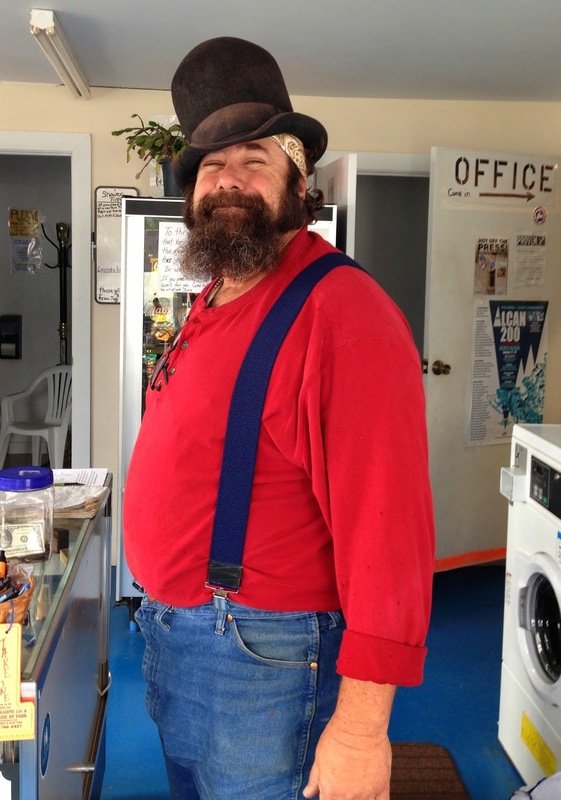 Buffalo arrived in Haines on his motorcycle in early June, looking for a place to rest a bit before heading on north. Apparently, that led to a job – Camp Host of Oceanside RV park. 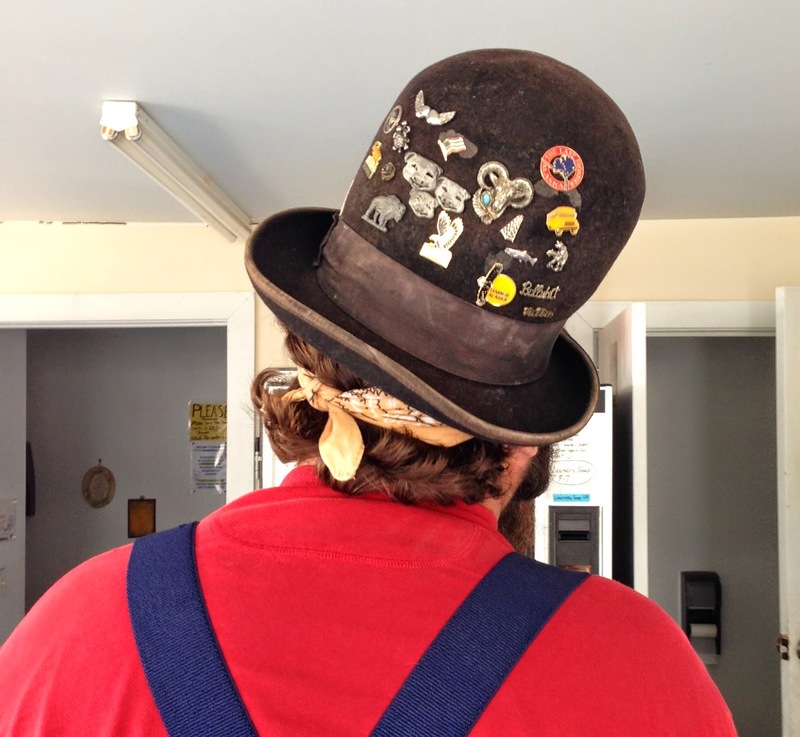 He’s a delightful character… adds a nice flavor to this place, as everyone smiles when they see him. I haven’t had much chance to talk with him… but maybe one of these days..
Yesterday… nothing too special about it, except the first hour and a half of my getting out of bed. Got up at 6:30 and turned on water heater and promptly went back to bed to stay warm. Alarm was set for when the hot water would be ready. Got up, fed the cats and off to the shower. Tried to use my hair dryer and was bummed it had quit working, apparently died and gone to hair dryer heaven. Got dressed, took Lois to the ferry terminal, figured a wet hair day in the rain was fitting. Got back to my rig, got out of the van and closed the door. But…. it would not close. What?!? Its pouring down rain…and the door latch did not engage. Went and got a trash bag, and a towel to cover the door to attempt to slow the drenching of the interior of van. Went back inside to ponder this… decided to try my hair dryer in a different outlet… nope, it did not work. Ok. it is what it is, I guess. Where does one find a hair dryer in Haines… probably nowhere. Sat down to check my email – my computer was dead, I mean completed drained on battery. But why was it on battery, it was plugged in. Yes, it was plugged in, but no light on the serge protector, no power. So somewhere between going to bed and attempting to turn on my computer – something had popped my breaker, no power. Good grief. Went about resetting the breaker…and I have a hair dryer once again. Great! So I decided to go back out in the rain to tackle the door latch. With a wee bit of help from a mechanical minded person, I got the door latch to at least close. They showed me how to make the door latch “think” its locked and then how to release it in that state. It works! After that initial hour and a half of yesterday… I kind of laid low for the day… or tried to. I laughed about all this… but was a little gun-shy of doing too much. As it is… I did have 2 left feet and it was just one of those days… lots of chuckles. Today is a new day… still raining… but I’ve got a ton of things to do, so onward. Whenever it rains it pours! HA! I hope everything is working now. Yes, when it rains it pours, doesn't it. What a crazy morning, but all is now in a better way… the door latch is doable too.